Precious metals futures declined Wednesday as the U.S. dollar gained against other world currencies. Gold finished at its lowest price in five weeks. Gold for June delivery declined $10.20, or 0.8%, to settle at $1,322.80 an ounce on the Comex division of the New York Mercantile Exchange. The close is the lowest since March 21. "As traders put geopolitical and trade risk in the rear-view mirror for the time being, how the dollar flourishes and wilts will be the primary driver of near-term gold sentiment," Reuters quoted Stephen Innes, APAC trading head at OANDA. 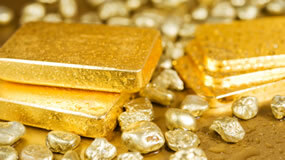 Gold futures ranged from a low of $1,320.20 to a high of $1,333.80. They advanced 0.7% on Tuesday, and dropped 1.1% in starting the trading week on Monday. July platinum lost $22.30, or 2.4%, to $912.70 an ounce, ranging from $911.40 to $934.90. Palladium for June delivery declined $4.15, or 0.4%, to $967.50 an ounce, trading between $951.80 and $969.